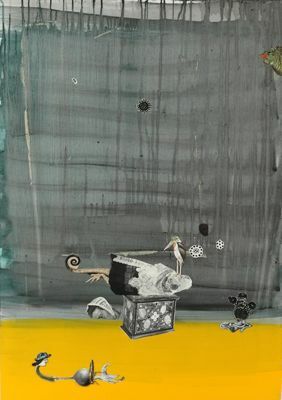 Gert and Uwe Tobias, Untitled (2011). All images courtesy of Maureen Paley, London. 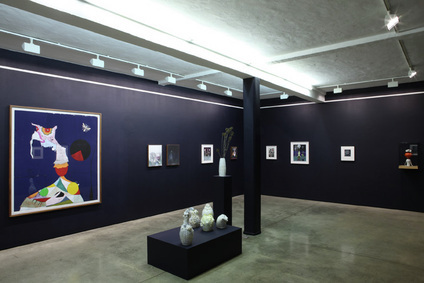 The work of Gert and Uwe Tobias is currently on view at Maureen Paley, London. The identical twin brothers collaboratively create large scale woodcuts, mixed-media works, and ceramic sculptures. The artists draw from a multitude of inspirational sources to create pieces that are visually stunning and technically innovative, appearing at the same time both playful and haunting. 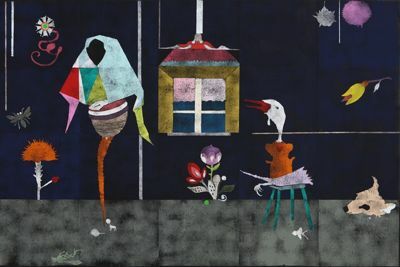 Decorative patterns, bold colors, and textile qualities are visual characteristics ever present in their abstracted cartoon-like figures, heavily influenced by the Eastern European folk art of their homeland, Transylvania. 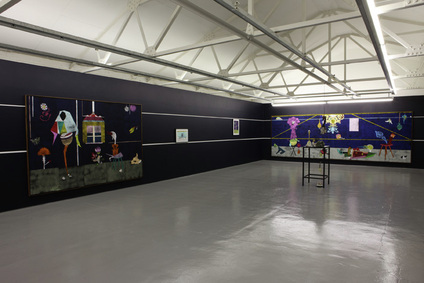 Ties to folk art and historical mythology are recurring elements in the work of the Tobias brothers. There is also visual reference to the Russian Constructivism as they incorporate strong geometric and typographic elements, and thematic ties to the carnivalesque scenarios of the Belgian expressionist James Ensor. Their first series of prints to garner critical attention was Come and See before the Tourists Will Do—the Mystery of Transylvania (2004), which was a direct investigation of their birthplace, Transylvania, and its relationship with popular culture. As the home of count Dracula in the Western imagination, the brothers looked to Hollywood horror films as a source of inspiration, while keeping the strong stylistic influence of Eastern European folk art in these woodcuts and the ones that follow. All the works on view at Maureen Paley are untitled, and imbued with qualities associated with the avant-garde Surrealist movement. 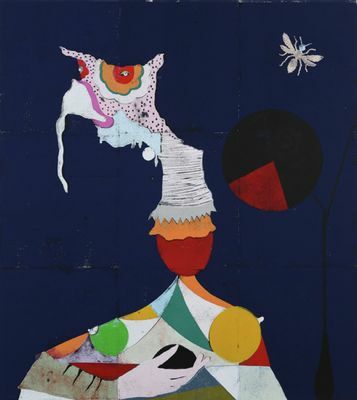 Large woodcut pieces hosting an array of abstracted fantasy figures evoke a darker, calmer yet equally poetic world of Miro’s “Harlequin’s Carnival.” Mysterious collage works that unite human and animal parts in austere landscapes are reminiscent of the surrealist collage tradition, particularly the similarly re-figured bodies of Max Ernst. Even their sculptural pieces, combining found objects with sculpted works, reference Surrealist objects. In addition, their collaborative process often involves passing a piece back and forth between the brothers’ studios. 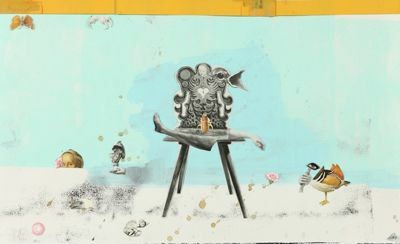 Working separately until completed, the Tobias brothers play a continuous game of Exquisite Corpse, a parlor game Surrealists employed as a way to tap into the subconscious. 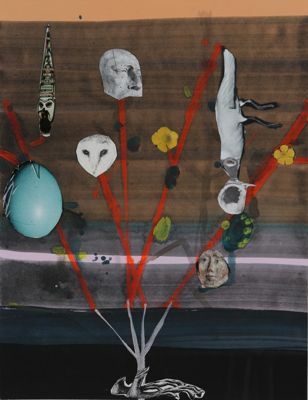 While the exploration of the unconscious mind was the driving inspiration for Surrealist artists, the Tobias brothers delve into various realms of consciousness and blend several influences to create their own work. This entry was posted on Sunday, January 8th, 2012 at 12:01 pm	and is filed under Art News, Go See. You can follow any responses to this entry through the RSS 2.0 feed. You can leave a response, or trackback from your own site.